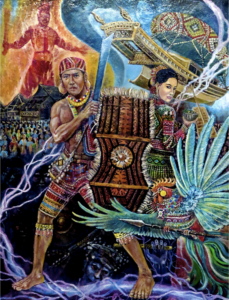 TUWAANG is the hero of several epics or songs of the Bagobo, indigenous group of southern Mindanao, which has several sub- groups. Anthropologist E. Arsenio Manuel was able to acquire and publish two songs in the late 1950s to 1970s, The Maiden of the Buhong Sky, A Complete Song from the Manuvu Bagobo Folk Epic Tuwaang and Tuwaang Attends a Wedding, with key informant Saddani Pagayaw, who learned the epics from the bard Inuk. After finishing some work, Tuwaang calls his aunt aside and informs her that the wind has brought him a message. He is to attend the wedding of the Maiden of Mo:nawon. The aunt tries to dissuade him from going because she foresees trouble. Tuwaang, however, is determined to go. He picks the heart-shaped costume made by the goddess, arms himself with a long blade and a dagger, and takes his shield and spear. He rides on a flash of lightning and arrives at the kawkawangan grassland. While resting there a while, he hears a gungutan bird crowing. He decides to catch the fowl, but soon sees the gungutan with a dagger-like spur. The gungutan tells Tuwaang he came to know of his coming in a dream and that he wants to go with him to the wedding celebration. Tuwaang agrees to bring the gungutan along. The two shake their shoulders and are carried into space. Upon arriving at Mo:nawon, Tuwaang is admitted into the hall. He sits on a golden stool, while the gungutan perches on a cross-beam. In the meantime, enchanting sounds from afar and flowering trees signal the arrival of the Young Man of Panayangan. Other gallants— the Young Man of Liwanon and the Young Man of the Rising Sun—arrive. Finally, the groom—the Young Man of Sakadna—arrives with a hundred followers. He haughtily asks the owner of the house to clear the house “of dirt,” implying the people in the house who do not count. To this insult, Tuwaang answers there are “red leaves” (i.e. heroes) in the house. Preliminaries of the wedding ceremony start. The savakan (bride-wealth consisting of articles and wrapped food to be paid for by the groom’s kinsmen) are offered one by one until two of the costliest remain. One is given the value of an ancient gong with ten bosses and nine relief-rings; the other is redeemable only by a golden guitar and a golden flute. The groom confesses his inability to redeem these articles. Tuwaang saves the groom from the embarrassing predicament by taking his place. Through his magic breath, he produces a more ancient gong, which is accepted by the bride’s family. He also produces the golden flute and golden guitar. The bride is now asked to come out of her room and serve the guests some areca nut chew. She commands her areca nut box to serve everyone. Magically, the box obeys, with the areca nut chew jumping into the mouths of the guests. After two areca nut chews leap into the groom’s mouth, the box moves on to Tuwaang before whom it stops altogether. Tuwaang brushes it away, but the box doesn’t budge. The bride decides to sit beside Tuwaang. The groom blushes; he is shamed. He decides to challenge Tuwaang to a fight. He goes down the house and challenges Tuwaang to ome down to the yard. After the bride unrolls and combs his hair, Tuwaang goes down to fight. The gungutan, mean­while, has been fighting the groom’s men and has slain a number of them until only the six gallants remain. Tuwaang and the gungutan engage the six gallants. Finally, only Tuwaang and the Young Man of Sakadna are left. Tuwaang is thrown against a boulder, which turns into dust. Trees get bent and topple. Tuwaang gets hold of his foe and throws him down so hard that he sinks into the earth. The Young Man of Sakadna resurfaces quickly and confronts Tuwaang once more. Tuwaang is thrust into the earth and sinks into the underworld where he talks to Tu­hawa, god of the underworld, who tells him the secret in overcoming his foe. Tuwaang surfaces and summons the golden flute in which the Young Man of Sakadna keeps his life. Tuwaang asks his foe to become his vassal in exchange for his life. The groom prefers death. Tuwaang therefore destroys the golden flute, ending his life. Accompanied by the gungutan, Tu- waang takes the bride home to Kuaman, where he rules forever.